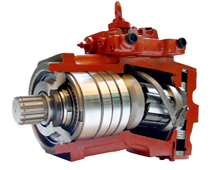 • EATON Vickers 10 and V20 series are fixed displacement and balanced type vane pumps. 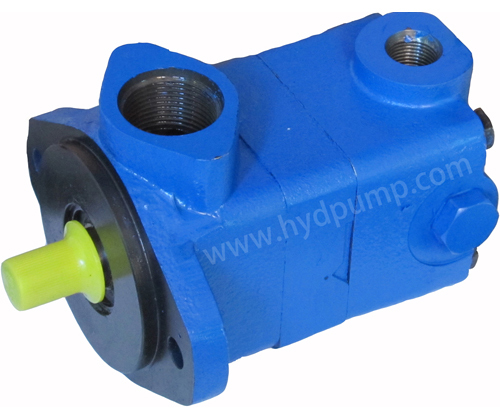 With compact sizes, they are available in single pumps and double pumps for both industrial and mobile application. • The vane pump is not damaged at low speed and high pressure operation because pumping action does not start until the speed is high enough for the vane to throw out. 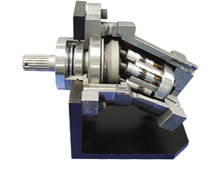 With hydraulically balanced design, the bearing is externally loaded only. Therefore, the pump requires minimized maintenance with long service life. • The inlet or outlet ports can be rotated through increments of 90o in relation to each other, providing application flexibility and easy installation. 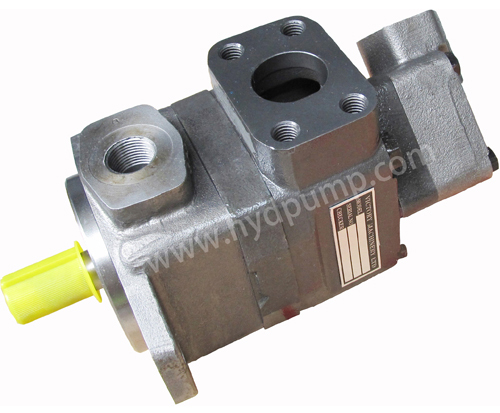 • With optional flow control and priority valve covers, the pump can be used in more applications. The flow control cover can limit the flow to the primary circuit at the required flow rate, while diverts remaining flow to the tank. The priority valve cover maintains a constant flow to the primary circuit, while diverts remaining flow to the secondary circuit. Each cover comes with a relief valve to limits the maximum pressure of the primary circuit. • Interchangeable with original Vickers pumps of the same model. • For maximum service life, the pump should be protected from contamination. Filtering fluid before filling and during operation to maintain or exceed ISO cleanliness code 17/14. Replaceable elements should be changed as filter supplier instructions. 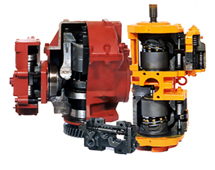 • The drive shaft must align with the power source shaft. Avoiding shaft end thrust and applications that impose radial loading. - Check the rotation of power source to match the rotation of pump. - Check inlet and outlet ports to assure all connections are properly installed and check all mounting bolts and flanges to assure all are tight and properly aligned. - Fill pump with fluid through the outlet port if the pump is mounted above the fluid level. The spline shaft models also need to be lubricated with an anti-fretting grease or similar lubricant. - Place all controls in the neutral position so the pump is unloaded during initial start-up. - Prime the pump within a few second when the pump is started. - Bleed off entrapped air from outlet circuit until a steady output flow is observed. Low vane tip/ring loading allows high pressure operation. High speeds are possible because the inlet flow paths are designed to give uniform oil acceleration, and thus better filling characteristics, particularly at low inlet pressures. Internal inlet and outlet pressure chambers are diametrically opposed. As a result, pressure-induced radial loads are balanced, and bearings have to carry the external load only. The superior design of these pumps makes them last longer. They’ve proven they’ll hold up in rugged applications. 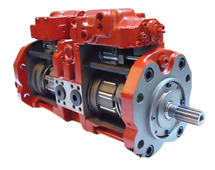 Vickers’ efficient design produces extra horsepower per dollar of pump investment, providing industry with low pump cost per horsepower capacity. High flow, pressure and speed capabilities enable these pumps to meet the hydraulic circuit needs of many types of modern machinery.